The Yamaha MT-125 is the learner licence-friendly baby of a burgeoning model family. Designed to be the entry point for new riders before they move on to the A2 world of the Yamaha MT-03 and beyond. At the top of the family tree you find the brutally fast Yamaha MT-10, and there’s the Yamaha MT-07 and Yamaha MT-09 in between. You even get a weird uncle in the form of the Yamaha Niken. The MT-125 has everything you need at the 14.7bhp restricted licence point in your riding. First and foremost, it looks fantastic. Its beefy stature (for a 125) and aggressive road stance make it look like a bigger bike than it is. In a move aimed at attracting younger riders, Yamaha also included a three-section digital dash which displays a clock, petrol gauge, trip time, mpg, distance to service and average speed. It's not just for new riders, though. A claimed mpg figure of 134 makes it a very attractive option for beating the traffic jams on your commute. It'll even cope with motorway speeds relatively well. 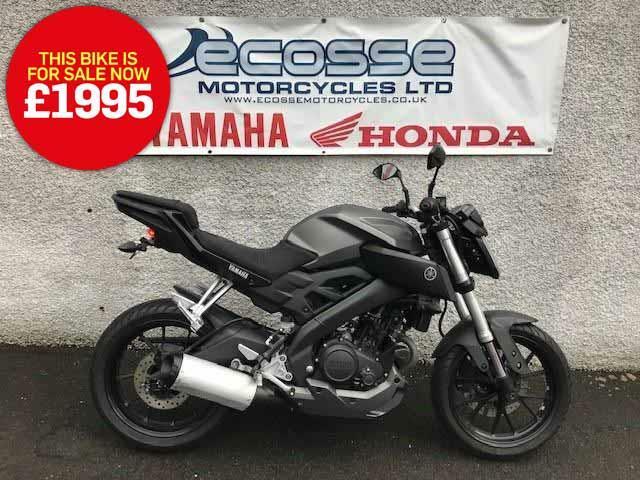 "This lovely Yamaha MT-125 is available from Ecosse Motorcycles, Dundee, in good condition. There are R&G radiator guards, crash protection and a tail tidy, as well as some other tasteful extras. "Unfortunately, this is a Cat D write-off motorcycle, however it has been fully repaired, with receipts to show. It will also come with a service health check and an MOT, too." Find a Yamaha MT-125 for sale.